Game Night review: An original, hilarious raunch fest – AiPT! It’s been a while since there’s been a raunchy R-rated comedy that’s truly great. 2017 had a bunch of throwaways like The House and Rough Night. I was a little worried about the genre’s future, but I’m happy to report Game Night ends its current drought. The premise is original, creative, and fun. Max (Jason Bateman) and Annie (Rachel McAdams) meet at a bar trivia night due to both being obsessed with games, fall in love, get married, and now host monthly game nights with some of their friends. They’re trying to have a baby, but Max’s sperm isn’t quite cutting it and the doctor thinks he’s too stressed. It’s discovered that the reason for his stress may be that his brother Brooks (Kyle Chandler) is going to be in town and apparently Brooks always tries to one up Max. After having a game night at Max and Annie’s house with Brooks, Kevin (Lamorne Morris), Michelle (Kylie Bunbury), Ryan (Billy Magnussen), and one of Ryan’s dates, Brooks proposes another game night next week at the house he’s temporarily renting. Everyone shows up the following week at Brooks’ place and he tells them they’re going to be taking game night to another level. He’s hired a company that “kidnaps” one of the players and then the rest of the people break up into teams to try and find clues until they find the kidnapped player. Apparently the entire thing is going to be super realistic. Brooks says he’ll give whichever team wins the keys to his car, which happens to be Max’s dream car. Two men come and kidnap Brooks after they get into a massive brawl with him. It doesn’t quite look normal to us viewers, but to Max, Annie, and co, it’s just part of the game. As they start to look for clues and delve into the mystery, twists and turns present themselves along the way. There are plenty of hilarious situations and moments along the way, an appearance by Michael C. Hall, and Jesse Plemons stars as Max and Annie’s odd next door neighbor cop named Gary. It may be my favorite performance by Plemons to date. He is so monotone, maybe creepy, maybe just weird. You’re not sure for a while. It’s amazing. Also, for those of us who are fans of the television show Friday Night Lights, seeing Chandler and Plemons back in a project together warms the heart (clear eyes, full hearts, can’t lose…I had to). Bateman and McAdams have great chemistry, and I think that chemistry is a big part of what propels the film to work since they’re the leads. There really isn’t a weak spot in the cast. The film, while a comedy, has a suspense thriller feel to it as well, and it really works well. I really don’t have any negatives about Game Night. I guess my only negative is it doesn’t achieve comedy classic status, but it’s about as much fun as you can have at the movie theater these days. Go see it. 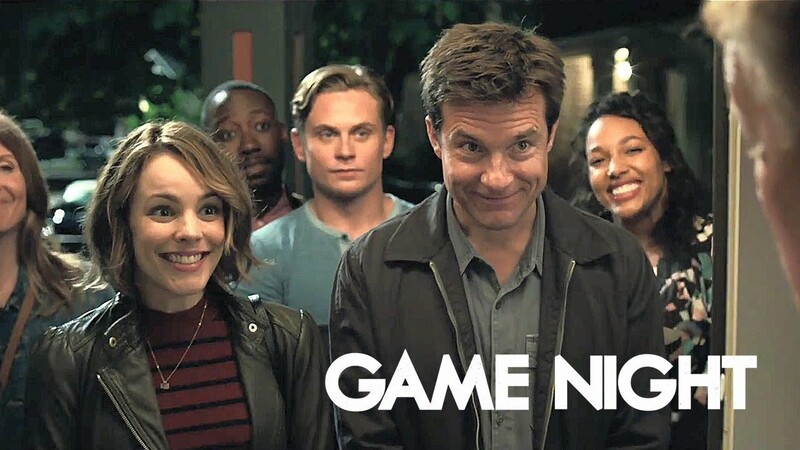 Game Night is a return to form for the raunchy comedy genre, bringing an original premise and a fantastic ensemble cast together for lots of laughs and twists along the way.